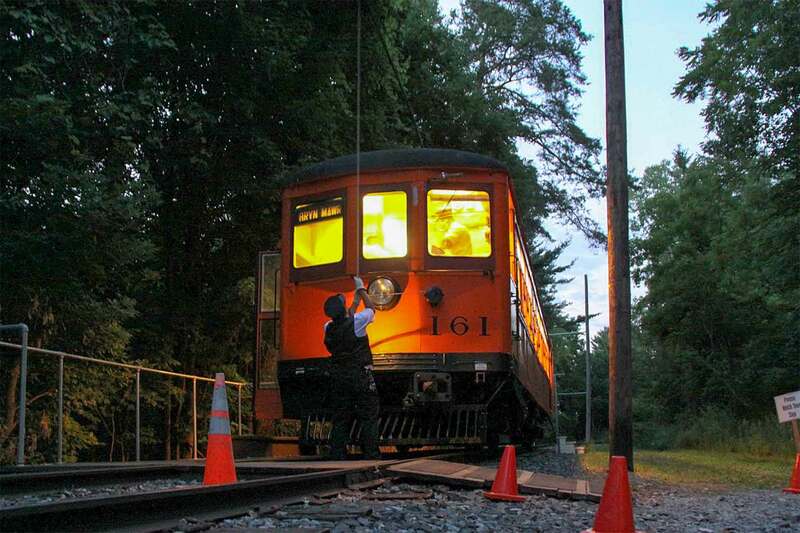 At Midway, Rich Fischpera puts up the pole by lantern light as P&W 161 prepares for its return run to the New York Museum of Transportation. Tower City Center (a.k.a. Cleveland Union Terminal) where all four lines of the Greater Cleveland Regional Transit Authority (RTA) meet. Three-car Metro Rail light rail train in downtown Buffalo. At Midway, Rich Fischpera puts up the pole by lantern light as P&W 161 prepares for its return run to NYMT. The Electric Railroaders’ Association is pleased to announce an exciting three-day weekend trip from Saturday, October 15 through Monday, October 17. 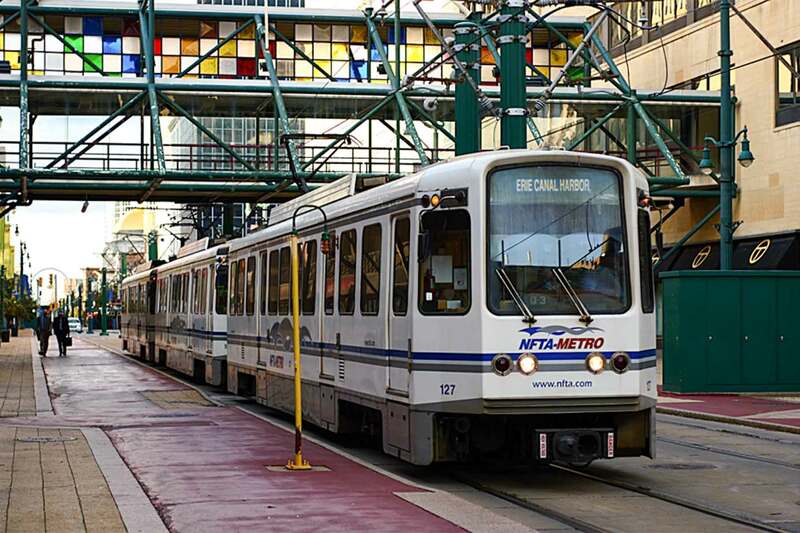 We will visit a famous transit museum in Rochester and ride important light rail lines in Cleveland and Buffalo. Our weekend begins with a chartered motor coach ride to Buffalo. We will depart at 8 AM sharp from 41st Street and 8th Avenue in front of the New York Times Building, directly across the street from the Port Authority Bus Terminal. Before arriving in Buffalo we will stop in nearby Rochester where we will tour the New York Museum of Transportation. The museum is known for having a wide variety of rolling stock including 14 trolley cars, a steam locomotive and antique highway vehicles. While there we will have an opportunity to ride an ex-Philadelphia and Western Strafford car. We will stay the night at the Hampton Inn Buffalo-Airport/Galleria Mall. 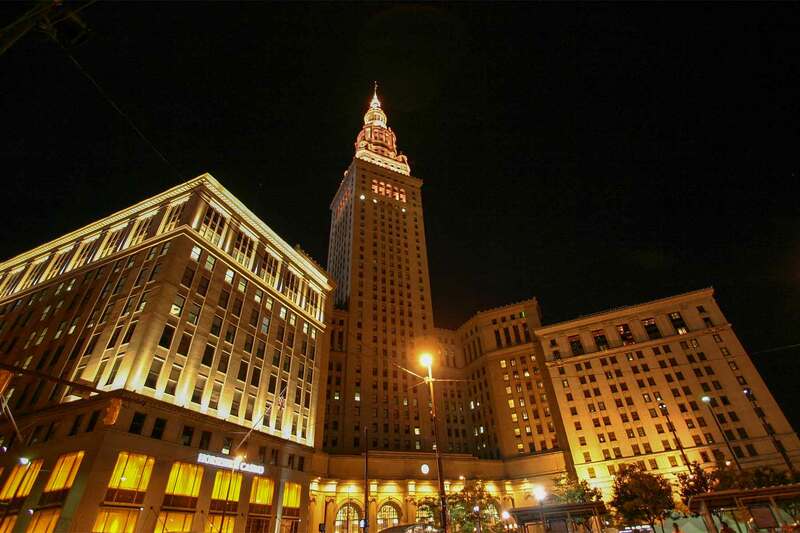 After a complimentary buffet breakfast at the Days Hotel, we will take a day trip to Cleveland, just three hours from Buffalo. Our bus will drop us off at Tower City Center (a.k.a. Cleveland Union Terminal) where all four lines of the Greater Cleveland Regional Transit Authority (RTA) meet. We will take a break for lunch, then ride on the Blue/Green/Waterfront light rail line. Depending upon when we finish, we will have dinner either in Cleveland or in Buffalo upon our return to the Days Hotel. The Rochester, Cleveland and Buffalo Weekend is only $295 per person, double occupancy; for single occupancy the price is $390 per person. That includes bus fare, museum admission, lodging and breakfast for two days. Other meals and transit fares are not included in the ticket price. Sold out For further information, please contact Robert Colorafi or call Michael Glikin at 917-714-7087.